MiShel Designs: Black and White Jewelry Challenge Reveal! 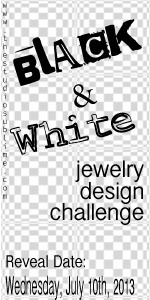 Black and White Jewelry Challenge Reveal! 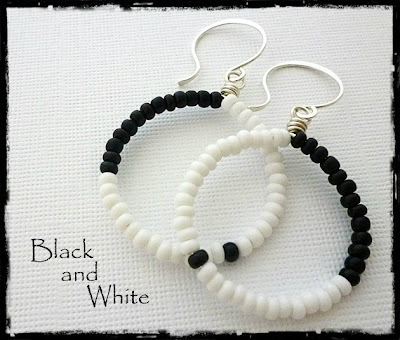 Those of you who know me or have followed my blog for awhile know that I LOVE Black and White Jewelry! You can check out my post here that I did when I got back from Italy last fall with mention of the B/W trends to come and see a couple of other pieces I've done in Black and White here, too! weekly photography challenge I participate in each week, sent out a call to participate in her Black and White Jewelry Design Challenge, I signed up in a heartbeat! Design a piece of jewelry that uses only black and white in the design. It can be elaborate or minimalist but only in black and white. 1. wire, metal or chain in silver, copper, brass, bronze, white or black can be used. 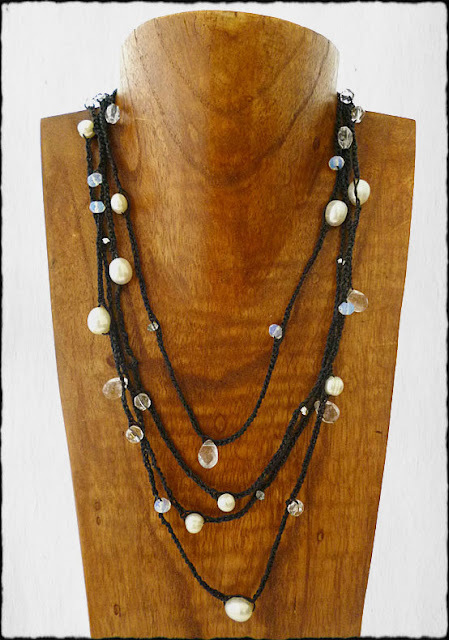 2. crystal or crystal AB color beads can also be used to ACCENT the piece. I kept it pretty simple, but this is what crept out of my mind and through my hands. that I created using sterling silver wire and black and white seed beads. They're fun,...and they feel good on. I'm not sure why I enjoy Black and White Jewelry so much. Maybe because it's 'safe', as I call it. It goes with everything, you can't really go wrong, color-wise, using black and white. Or maybe it's the mystery of black, the purity of white, and the contrast of the two. 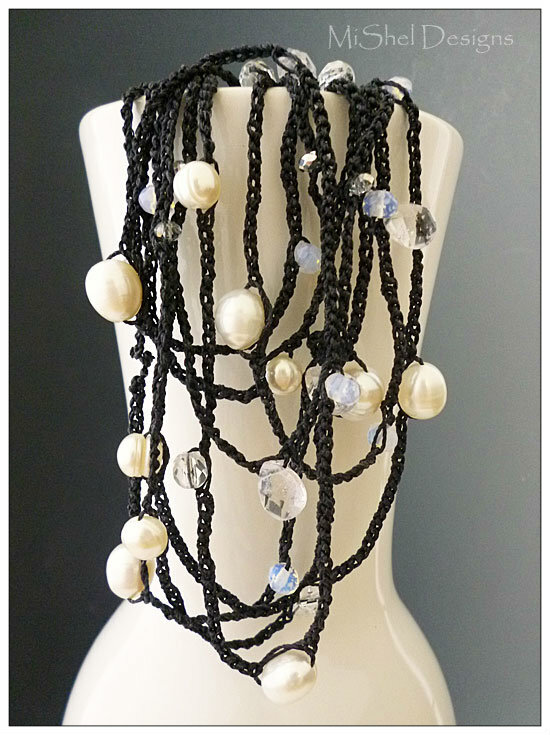 crystals and moonstones on some Black C-Lon Cord. It's dramatic. It's got flair. knotted on black Irish waxed linen. Thanks Sally for creating a blog hop that has flair and drama! 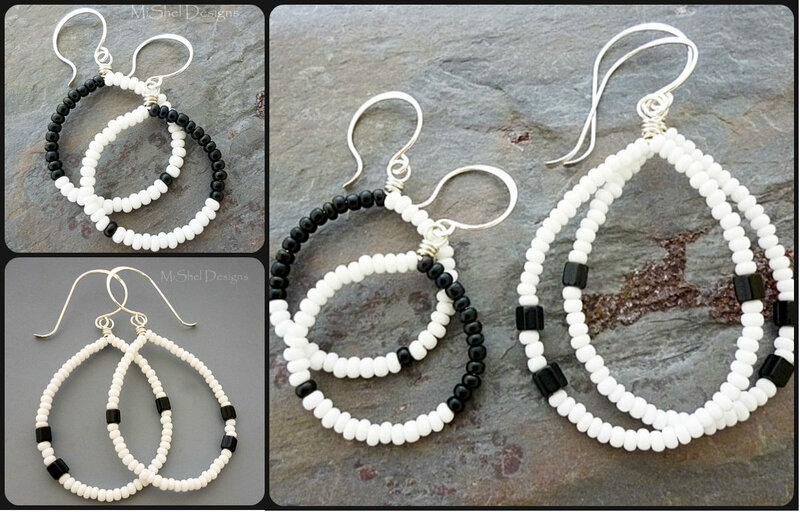 It's been a blast creating Black and White Jewelry! Now, hop along down the list of participants below and check out all the Black and White jewelry they have created for this challenge - I'm sure it'll be an eye-pleaser! Peace, Love and Creating in Black and White! I agree with you 100%...b&w just oozes class! Those hoop earrings are sooo cool...love that design! And your hand crochet project turned out fabulous! All your pieces are really pretty. I love the mod earrings! I am a big fan of black and white also. 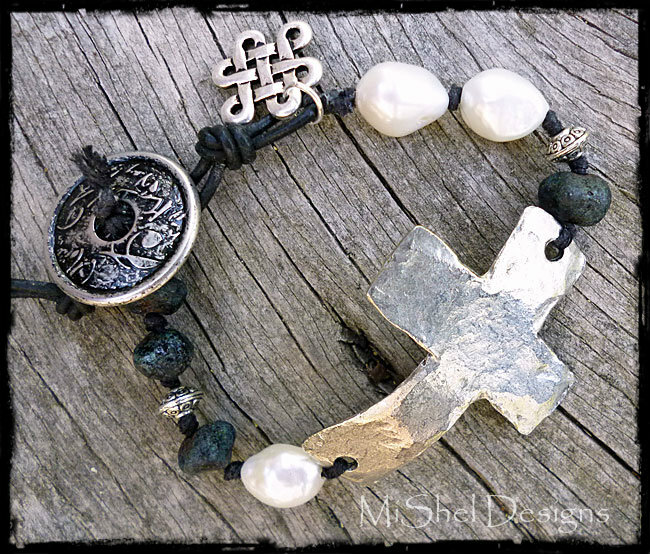 The bracelet with the pewter cross is the only photo that loaded in browser. The cross is really well done. Thanks for the 'heads-up' on the pics Kathy - I appreciate that. Not sure what's up but blogger's giving me problems loading pics again. Sorry about that. They're all loading on my computers now, so hopefully everyone else can see them all now, too! These are all beautiful pieces, but the simplicity in those earrings grabbed me. I love those! I never get tired of the versitile black/white color combination. 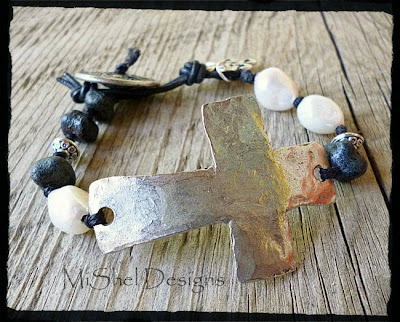 Your pieces are wonderful and I especially like th rustic cross bracelet! Wow, I love your pieces! The crocheted one is my fav. I crochet also and have signed up for a challenge that I want to use it in. Great job. Thanks for sharing. Shel, I don't know where to start my mind is racing about trying to take in each and every detail of the pieces you created, beautiful work my friend! I surly couldn't pick a favorite! From the mod earring to the organic yet elegant cross and the crochet work in between you did such a wonderful job! BEAUTIFUL, BEAUTIFUL WORK!! Thank you so much for participating in the challenge! Gorgeous. Amazing how black and white, in your hands, takes on such warmth and grace in your bracelet. Your crochet necklace would look SO chic against a t-shirt and jeans. And those earrings! LOVE! Really like the round pair of earrings with the sinlge black bead in amongst the white... I think it's the contrast between the black and the white that makes it work... some of my white was etched clear & black glass is really purple so my contrast isn't nearly as dramatic as the pure white and black black! We can't know light without the dark, Shel... even with the limitation of using these two "colours", your thoughtful and beautiful pieces have illustrated how versatile and creative black & white can be. Ooh, very nice. The smaller earrings look like a variation on the yin/yang symbol. Very poetic discription of why we all like black and white, too. I think I really like that first necklace the most. All of your pieces are gorgeous! My favorites are the half black and half white earrings and the cross bracelet. Awesome job on all of them. Shel - Your creations are SO distinctive! Just love your use of bead crochet - really adds a different look. And the earrings at the top are really great - so basic but drew my eye right away. You are amazing! Those hoops are making me smile, ear-to-ear :) So cute! The crocheted necklace is to die for. I love long necklaces and this is a beauty! Love, love, love those earrings, have a dress they would go perfect with!!!!! Ohhhh and that bracelet, L.O.V.E it! That crocheted necklace is SO FUN! 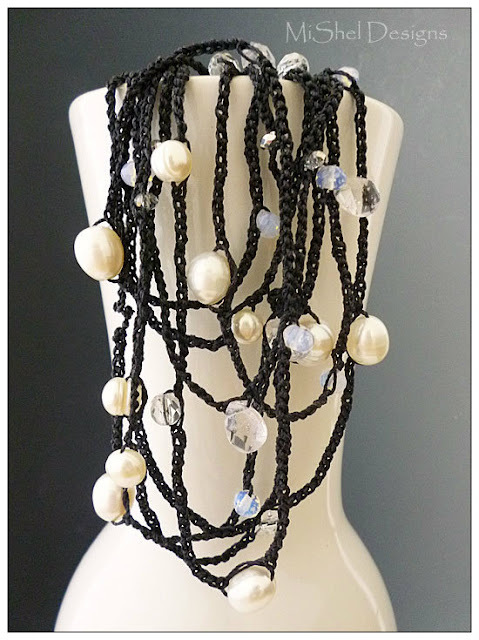 I love multistrand pieces, and that one is so versitile it could go with almost anything. Gorgeous!